Ah, Winston Peters… ’tis winter, but he could hardly be feeling more contented. 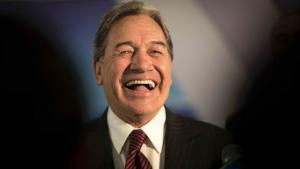 Traditionally Peters and his party are good finishers in election campaigns and yet this year they’re already enjoying a strong 11% showing in this week’s ONE News Colmar Brunton poll and blimey, they seem to be doing just as well in the rolling poll of polls. The same polling also indicates that the government’s partners (Peter Dunne, Act and the Maori Party) cannot currently deliver National a parliamentary majority. Peters is needed. Ergo, he must be wooed. At this rate, July, August and September might as well be officially designated as Be Nice To Winston months by the two major parties – since from here until election day, both will be diligently striving to ensure the New Zealand First leader will be feeling kindly towards them, come the morning of September 24. Take Andrew Little for instance. When former Labour MP Shane Jones recently hitched his wagon to New Zealand First, did Labour rail against rank opportunism and/or denigrate Jones and his new knuckle-dragging mates? Not at all. Instead, Little gritted his teeth and suggested Jones would add some “ intellectual grunt” to NZF. True, this comment could be taken as an oblique criticism of the IQ of the average New Zealand First MP – but it sounded like a compliment and crucially, Little avoided calling Peters himself into question. Trust the Greens to be the only ones to ripple the pond. With good reason, they’ve concluded the return of Jones has put a sizeable crimp into the Greens’ plans to enter into formal coalition with Labour. With nothing much to lose – and with the related need to fire up its own base – Greens co-leader Metiria Turei has chosen to take New Zealand First head on. To all intents, we’re watching a re-run of 2005, when Helen Clark chose Peters ahead of the Greens. Back then, Labour decided to form a coalition partner of the centre, instead of heading leftwards. Anyone voting Labour this year needs to be aware of the potential for history to repeat itself. On the weekend, Turei called out Peters for what she called “a very racist approach to immigration” and attributed his poll standings to that stance. Not surprisingly, Peters has now counter-attacked and on RNZ this morning, he promised more of the same. The more important point is : does National agree with Turei about the negative, allegedly racist nature of NZF’s stance on immigration, or does it side with Peters? At yesterday’s post-Cabinet press conference, I asked PM Bill English whether he thought there was any merit in Turei’s criticism. Tellingly, English digressed into a ramble about disunity among the opposition parties, and how Peters didn’t strike him personally as a racist – but who knows, he added, maybe the Greens might have heard something that he hadn’t during the communications among the Opposition ranks, which were probably closer than his were with Peters etc etc. When reminded that the question was about immigration policy – and Turei’s charge that it was racist – English once again hightailed it into a forest of generalities. Clearly, that’s the challenge facing the media in the election run-up. This year’s contest is no longer about the National vs Labour horse race – because there’s clearly no horse race in the old FPP terms when National is polling 20 points ahead of Labour, and not much of an MMP contest either, given the mutual antipathy between NZF and the Greens. On the current evidence, the only contestants likely to reach the political altar at the conclusion of this reality series are Simon William English and Winston Raymond Peters. We owe it to the viewing public to find out how compatible this pair really are, well before we wake up on September 24 facing a National/New Zealand First coalition. Among other things, this outcome would deliver the most socially conservative PM/deputy PM pairings we’ve seen in decades. What will Winston want from National, and what will the government be willing to give him in return, especially on immigration and superannuation? We need to be exploring all the ramifications of the relationship between English and Peters before they elope and it all becomes a fait accompli. Even if that sort of analysis annoys the hell out of Winston Peters. Now that Islamic State has been driven out of Mosul, the former capital of its phony caliphate in Iraq, what are our troops now going to do? Come home? That sounds sensible. Job done, money involved better spent on needs here at home etc etc. Yet apparently not. Judging by PM Bill English’s responses at yesterday’s post Cabinet press conference, we’re now waiting patiently for an invitation from the Iraqi government to ask us to take on some role so far, unspecified… but presumably in training Iraqis for internal policing and nation-building. Keep in mind this invitation will be emanating from the same Shia-dominated Iraqi government whose ham-fisted rule of the country’s Sunni minority a decade ago served to propel Islamic State to national, regional and global prominence. Are we really waiting on the whims of this dysfunctional regime in Baghdad before we make our own foreign policy/defence decisions…or has Iraq become one of those parties where we don’t want to be seen to be the first to leave? We seem to be waiting around in the kitchen until the host signals that its time for everyone to head off home to bed. In fact, this decision is one we need to be making ourselves – given that it involves putting our troops in harm’s way for a mission whose prime purpose has now been concluded. And are we keeping faith with the Iraqi government by staying on indefinitely, or with the Trump administration? If we’re planning on having our troops stick around until Iraq is safe for future generations, that exit strategy won’t reach an endpoint until oh, maybe 2050. What’s the current criteria for getting our troops out of there ? Trust me, this column isn’t for bleeding heart liberals. Not only, not always. Sometimes Werewolf tries to deal with the existential decisions facing the tycoon sector – such as buying a plane. Apparently, the most common mistake in buying a plane is to focus on only one requirement to the detriment of your other needs. Don’t make that error, people! For example, once a year, you fly to Hawaii with ten family members for a week-long vacation. For the remainder of the year, you typically fly alone, perhaps with one extra passenger, for distances of little more than a few hundred miles. Do you buy a large 12-passenger plane that is much too big for your usual needs or do you buy a smaller aircraft and work with an agent to charter something larger for your week in Hawaii? [We] advise: “Buy the airplane you need for 99% of the time, NOT the remaining 1%. For your further reading: the seven mistakes commonly made when buying an aircraft. The relationship in question didn’t work out, but the song remains as a perfect expression of that need to resolve…things, even if it means bad news. At least then you know where you stand, and can get on with it. “You took me out and took me in, and told me all of this…” So put up, or shut up. Bill Callahan’s “Small Plane” is about the other end of the process, when desire and compulsion has found a place to land. Since the official video for this song is so irritating, here’s a live version Callahan recorded in a New York community garden. And while a million great Callahan songs and performances exist online, the theme this morning is flying, so that means being drawn back to “Teenage Spaceship” ….a song that captures the supreme loneliness of adolescence as well as any song ever written.